This spectacular home will please the most discerning buyer with nothing overlooked during the extensive remodel process. 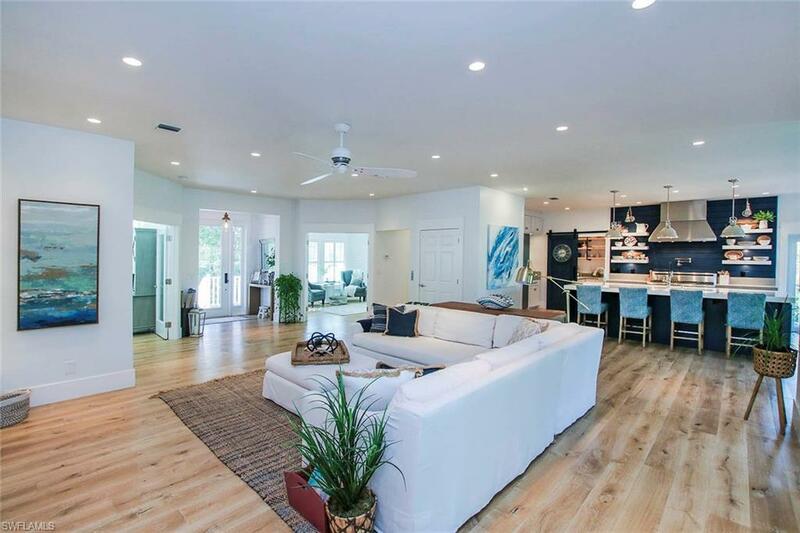 Attention to detail best describes this immaculate near beach home located just off of Sanibel's premier West Gulf Dr. Nestled in a small community of only 10 residences, this is the perfect island location offering deeded beach access across the street. The current owners left no stone unturned while envisioning this cutting edge green remodel and it shows the minute you enter the front door. Premium engineered oak wood floors, open concept, 2 additional spacious rooms. Chef's Kitchen w/ Thermador SS Appliances, gas range, 48" Refrig/Freezer, 2 dishwashers, Butler's Pantry, Certified green wood cabinetry, Quartz island. Spacious Master BR suite w/ double mirrored custom barn door, stand alone shower, double vanities/sinks w/Quartz. New metal roof - 2016, full service 3 stop elevator, impact windows/sliders, new HVAC - 2014/2016, VOC-free paint, plantation shutters, newer water htrs., whole house dehumidifier - 2018, 500G buried propane tank, salt water pool resurfaced in 2015. Dare to compare to new construction, this is the benchmark!